This was the first time I ever saw my writing in print, but clearly President Nixon, an avid reader of Time magazine, must have seen the line, and must have seen the letter, as well. No doubt, as a result of that letter, Nixon entrusted Kissinger with the job of opening up relations with Communist China, and the rest, as they say, is history. OK, perhaps I exaggerate my role in terms of Kissinger’s success. Truth be told, he probably didn’t need a boost from the likes of (14-year-old) me. Of course, Henry Kissinger has been one of the principle figures in diplomacy in national security for more than forty years. His new book, World Order, is described on the cover blurb as a “deep meditation” on the state of affairs in the modern world. “Deep meditation” is what publishers write on flap jackets when they aren’t entirely sure what the book is all about or for whom it’s intended. The purpose of the book cannot necessarily be gleaned from its contents. Kissinger essentially tells the history of everything, taking us through centuries of European war and peace, as well as the broad sweep of Middle Eastern history. The book is so ambitious that only someone like Kissinger, if there is anyone out there like Kissinger, could undertake it. 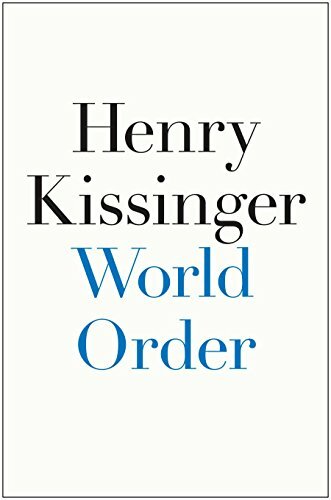 Kissinger sees the world as a battleground between the West’s desire for order, as marked by the Treaty of Westphalia, in which European nations finally agreed to sit down, wipe the smiles off their faces, and pay attention, and the Islamic desire for purity, which courses through the heart of the modern day Middle East. The challenge in reading Kissinger’s book is to identify whether it is intended as a guidebook for newly-minted diplomats, a text book for college students, or a means of influencing the way intelligent people think about the world. I found myself impatient with the book, wishing that Kissinger would “get on” with his historical references, and instead be a little less diplomatic and nuanced in his pronouncements about what’s really going on out there. The book has a deferential tone when talking about leaders of nations like Saudi Arabia, whose interests don’t always align with ours. I found myself wishing that Kissinger would just lay it on the line and tell us what he really thinks of the people and movements shaping the globe today. How does it feel, after having spent decades trying to put the world back together after World War II, Vietnam, and the oil shocks of the 1970s, to see the whole thing on the verge of falling apart all over again? How does he really feel about nations that are sometimes allied with the United States, and sometimes overtly or covertly opposing us? These would include Pakistan and Saudi Arabia, to name two. Doesn’t he ever want to just reach across the table and slap some world leaders into decency? What should we really do about Iran? Let them develop nuclear weapons, or stop them through diplomatic, economic, or military means? If Iran goes nuclear, won’t Egypt and Saudi Arabia feel compelled to do so as well? Is that a good idea? What does Kissinger think about President Obama? Does he respect the guy? Or does he feel, as at least half of the United States, Vladimir Putin, and the people running Iran, that the current occupant of the Oval Office is in way over his head? That’s what I’d really like to see. Enough about the Treaty of Westphalia and the Wahhabi desire for purity. Let’s have Henry Kissinger unplugged. Let’s hear what he really has to say about the state of the world and the people who run it. Such a book might not be as stately or scholarly as World Order, but it would probably be a hell of a lot more fun.